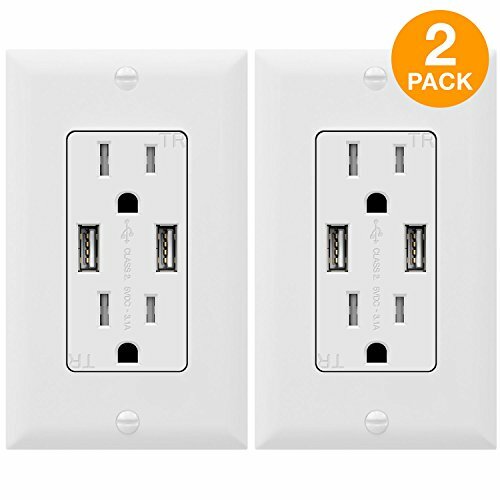 The TOPGREENER TU2153A is a wall outlet with USB ports. The dual USB ports reach up to 3.1A combined, which is enough to charge your daily electronic devices. Make charging fast, easy, and convenient in any room of your home! From the bedroom to the living room, there is always a spot for your TOPGREENER USB charger outlet. Create much needed charging stations while minimizing clutter to your walls and adding more functionality to your home. Your electronic devices now have a better power center, and your room will always look tidy and neat.The TU2153A USB Outlet is equipped with a smart IntelliChip, which reads the power needs of devices connected to the USB ports to deliver optimal power. By charging at the optimal power allowed by the device, IntelliChip protects your devices from overcharging and overheating. Each USB port can reach up to 2.4A individually, with a maximum 3.1A output when both USB ports are in use. Charging is now more convenient and efficient! (Please note that the USB ports do not support Qualcomm Quick Charge technology. )Tamper-resistant receptacles comply with 2011 National Electric (NEC) requirements and feature an internal shutter mechanism that prevents unwanted objects from being inserted into the receptacle for increased child safety. The USB wall outlet is back and side wired for compatibility with diverse wiring needs. The TU2153A can fit in any standard in-wall outlet box. This two pack includes two decorator standard wall plates.